Bras are a necessary part of any woman's wardrobe but they can be very expensive. Quality, fit, wearability, and price all need to be factored in when shopping for bras and foundation garments. This is a guide about saving money on bras. Occasionally, I find that a bra is a bit too tight, even though it should fit. The answer? Old-fashioned bra extenders! They are strips that you hook onto the back of the bra that give you more "eyes" to fasten the bra with. I found mine at a thrift store, and because they were 4 hook ones, I just cut them in two, creating twice as many. They usually are white cotton, but you can tint them to match your bra: tea for beige bras. I tinted my extender pink for my pink bra using a pink highlighter. I then spread out the tint by applying water. Voila! It almost matches. The extenders are available on the net for $6 or so. Source: Me, although I think my mother had some way back when. Sometimes bras need adjustment, especially if you have an in-between size (for example, a bigger overall measurement with a smaller cup size, or perhaps you have some pricey bras that used to fit, but are a bit tight now). In any case, they used to sell bra extenders, but to make your own, cut off the hook end on one side and the eye end off the other from an old bra. Then hook the one side and the other, so you have extra room. Sew or pin the excess material between the secured ends. Voila! A bra that fits and won't cut off your circulation! In addition, it might make a bra loose enough to slip over your head, if you have issues with your shoulders). P.S. Also save the elastic from old bras to use again on small projects. Lace might be recycled, too. These warm days bring out many backless and strapless outfits. Adhesive bras are very in right now (I know I love them), but they lose their stickiness after a wear or two. Not very thrifty! Here is a trick to get at least a dozen wears out of them. After every use, rinse the inside sticky bra cups with warm water and a touch of soap, then let them air dry. All the oils from your body will be gone but the adhesive will come back when dry. Please don't miss out on doing this. It's a HUGE money saver. I shudder when I see bras for $30-40 or more. That's a lot of money to me! I discovered that I could get perfectly good ones from dollar stores! I have gotten Hanes unstructured bras from the 99 Cent Store here in Los Angeles. I love my older more comfortable brassieres but they tend to get rough on the edge so I decided to try sewing some really soft scrap material on the edge to get more life out of the bra. I recently learned how to tell when it was time to retire your bra. 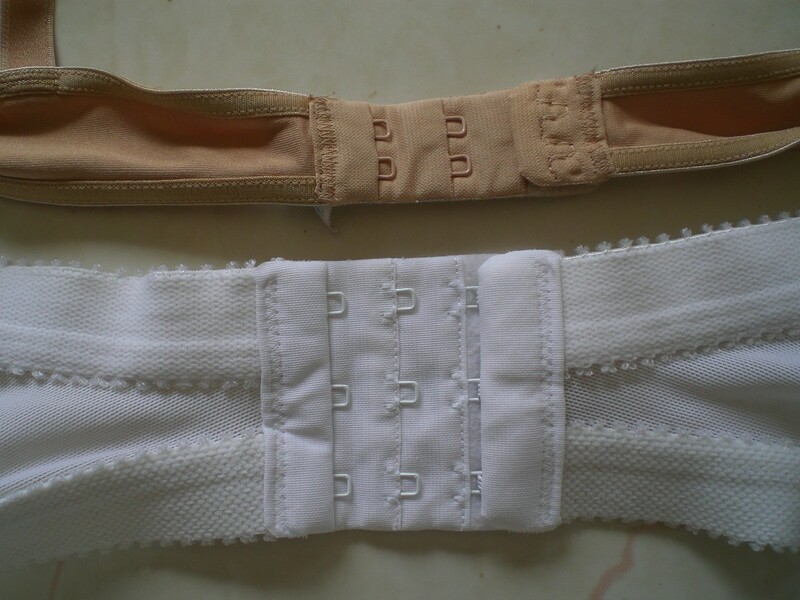 Bras are made with three sets of clasps/hooks. When new, you should be using the first clasp making it the widest or loosest setting. Bras are so expensive, and a good fit makes such a difference to posture and appearance. I sew tucks in the straps and backs of bras that have stretched, to tighten the fit again. Does anyone have any other ideas on how to save money on bras? I get all my bras at Kohl's on the reduced rack. I've never paid more than $10.00 for a name brand bra. I have a Kohl's account so I usually have a coupon which brings the price down. I will never pay full price for a bra that's retailing for $50 and some even more than that. I buy all my night gowns and pj's from the reduced rack. They reduce them at or near the end of each season.